Sir Vicar (prime minister of Hyderabad and Berar) used the palace as his private residence until it changed owners and the palace was handed over to the 6th Nizam of Hyderabad around 1897-1898. Sir Vicar, besides being the prime minister of Hyderabad, was also the Amir of Paigah and was the maternal grandson of the Nizam III. He was married to Nizam VI older sister who also known as Lady Viqar ul Umra. The monogramme VO of Sir Viqar ul Oomra is seen on every part and furniture of the palace.. The Falaknuma Palace was built and furnished by Amir e Paigah Sir Viqar Ul Umra at a cost of forty Lakh rupees and it is said that even sir Vicar whose estate and income was more than a 15 gun salute state had to borrow money from Bank of Bengal to complete his dream project (Paigah was referred to as a State within a State due to its sheer size, wealth and income). In the spring of 1897 Mehboob Ali Pasha Nizam VI was invited to the palace, the Nizam liked the palace so much that he decided to stay back as this was his older sister Lady Vicar's residence. He extended his stay to a week then a fortnight and finally a month this prompted Sir Viqar to offer that if his sovereign liked the palace he would be honoured to give it to him as Nazar (offering). The Nizam liked the gesture but, being the grand man that he was, it is said as per Royal family sources that he paid Sir Vicar a substantial sum. However the members of the Paigah family maintain that about 20 lakhs was paid by H.H. The Nizam and the rest was accepted as Nazar or Offering. The Nizam used the palace as a royal guest house as it had a commanding view of the entire city. The Falaknuma fell silent after the 1950s. The last guest important was president of India, Rajendra Prasad, in 1951. The palace was mostly kept closed since then and underwent a huge restoration after it was given on lease to the Taj Group of Hotels. The responsibility of the restoration to its original grandeur was led by H.H Princess Esra Jah, the first wife of H.E.H The VIlIth Nizam of Hyderabad. One of the highlights of the palace is the state reception room, where the ceiling is decorated with frescoes and gilded reliefs. The ballroom contains a two-ton manually operated organ said to be the only one of its kind in the world. The palace has 60 lavishly decorated rooms and 22 spacious halls. It has some of the finest collections of the Nizam treasure. Falaknuma houses a large collection of rare treasures including paintings, statues, furniture, manuscripts and books. The famed dining hall can seat 100 guests at its table. The chairs are made of carved rosewood with green leather upholstery. The tableware was made of gold and crystal to which fluted music was added. The length of the table is 108 feet, and breadth is 5.7 feet and height is 2.7 feet. The palace has a library with a carved walnut roof: a replica of the one at Windsor Castle. The library had one of the finest collections of the Quran in India. The ground floor of the palace housed the living quarters. A marbled staircase leads to the upper floor. It has carved balustrades, which supports marble figurines with candelabra at intervals. There is a billiards room. Burroughs and Watts from England designed two identical tables, one of which is in Buckingham Palace and the other in the Falaknuma palace. On the walls of the landing are many oil paintings and photographs of notable personages. The telephone and electrical system was introduced in 1883 by Osler and the palace has one of the largest electrical switchboards in India. The palace was the private property of the Nizam family, and not normally open to the public, until 2000. In 2000 Taj Hotels started renovating and restoring the palace. The renovated hotel was opened in November 2010. The rooms and halls were decorated with ornate furniture, handcrafted tapestries and brocade from France. The interiors have English and Venetian chandeliers and intricate frescos, and have outdoor terraces with rare artefacts, including paintings, statues, furniture, manuscripts and books. 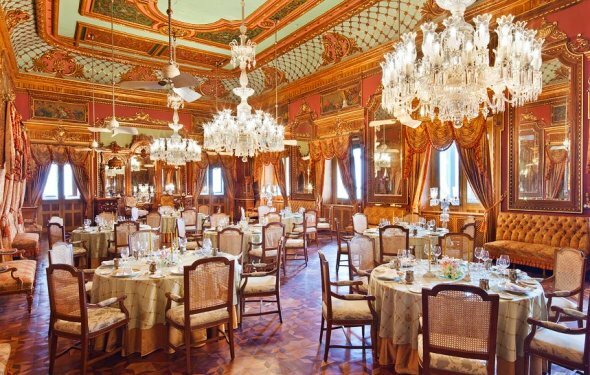 The palace has a 101-seat dining hall, considered the largest in the world, and the Durbar Hall, embellished with intricately carved wooden ceilings, parquet flooring, walnut furniture and handcrafted mirrors. Falaknuma Palace is now a Heritage Hotel under control of the Taj Group of Hotels.You can see the hotel if you have dinner there :-) It is not open to the general public anymore. As an alternative I will suggest you check out Chowmohalla Palace, located near the Charminar. It is not as grand, but definitely worth a look. The Taj Mahal Hotel is a robust and strong structure which was able to weather the explosives and dastardly design of the terrorists. The Tatas have decided to rebuild it and restore it to its glory and rightly so because it is the pride of India and no new structure will be able to restore the same pride and historical prestige. If the structure would have been destroyed (gratefully it was not) then it would not have been possible to rebuild this most amazing landmark of Bombay & India. Where is the Taj Palace hotel located? The Taj Palace Hotel is to be found located in the heart of the capital city of India, New Dehli. The hotel plays host to Heads of State, celebrities and leading businessmen and is ideally located close to the airport, city centre and most of the Embassies located in New Delhi. Mahatma Gandhi Road or MG Road is at the heart of Chennai, situated in the Egmore - Nungambakkam division or taluk. It is a busy and highly commercialised stretch of Chennai. It is very popularly known as Nungambakkam High Road (NH Road).